It’s time to join the hair revolution and trade in your go-to daily styles for a hot new look. We’ve got all the hairstyle inspiration you need to transform your locks, whatever style you want to rock or hair length you’re flaunting. Make your hair the centre of attention at your next big event. 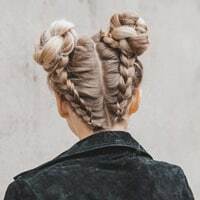 Our collection of occasion hairstyles has you covered for nailing that boho look at a music festival, dancing the night away at a prom or party, and being the epitome of elegance for your wedding day. Take a look behind the scenes and learn how to recreate the hottest looks from the red carpet, featuring tips and tricks from the most influential celebrity stylists using our award winning tools. From long locks to chopped tresses, sharpen your hair skills with the help of ghd. For salon-worthy locks at home, follow these step-by-step guides and achieve the hairstyles of your dreams, whatever your length. From beautiful waves to intricate updos, discover the tricks of the trade and enjoy a good hair day, every day. Become the queen of bold hairstyles when you lend inspiration from these seriously stunning looks. Think chunky plaits, wavy half updos and chic curls. With these on your side, you’ll command attention. With the latest from the catwalks and the best of street styling, keep your hair on trend whatever the season with ghd. Let ghd be your styling guru when it comes to your next hairstyle. Follow our super chic how-to videos that take hairstyle inspiration to the next level. Don’t conform with your hair – reinvent your tresses with these effortlessly easy guides. Keep up with all the latest styles and trends in the world of hair with ghd. Follow our monthly must-have seasonal looks, brought to you by #TrendingNow. Getting to grips with the best techniques and tools has never been easier. Tap into savvy tips and helpful advice from our hair experts and get clued up on the ideal ways to style your tresses. Discover a world of gorgeous hairstyles for oval faces. Cheat your way to a salon blow-dry at home. Whether you're the bride or a guest, get inspired with our wedding hair updos. Make sure you've got your look nailed come festival season with our easy guide. ghd and Eugene Souleiman style hair for the Preen by Thornton Bragazzi catwalk show. When it comes to spring-cleaning, why stop at just your wardrobe? Hail to the cropped locks! Follow our ghd to short hair perfection. Eugene shares the secrets to the SS18 looks as Tommy Hilfiger & Gigi Hadid puts on a circus spectacular at LFW. Adam Reed creates Straight Up Luxe for timeless glamour at the Julien Macdonald SS18 LFW show. Get lost in a beautiful world of hairstyles and be inspired to step out of your comfort zone on our Instagram feed.